Location, Clean and friendly, Great for families and surfers. Brand new kitchen! The unit is our vacation house, family friendly and functional with amazing location, garage parking, patio/grilling. But it is not new house, nor a 5 star hotel. We also changed property management company to provide higher quality control and responsiveness. This unit does not have ocean views from inside ( the picture was taken from the street). Location, location and location! This second floor unit is located on one of the best courts in Mission Beach. No one on top of you or below you. 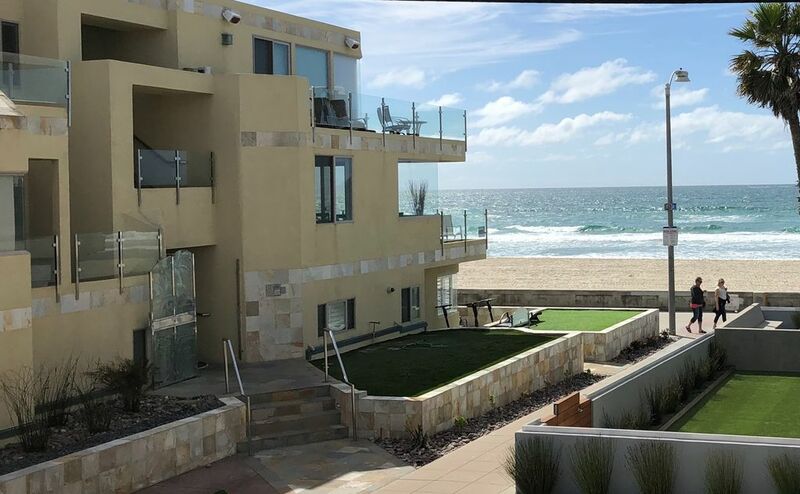 It is one house from the water and boardwalk, and steps to dining and activities (Please note that the unit is not ocean front and has no ocean view). Clean and bright with new hard wood floors, this unit is perfect for the couple or for a family wanting to get away. Recently, we added new ceilings with extra insulation and ceiling fans ( living room, dining room, and bedroom), as well as a dish washer and new mattresses. This property has a queen bed in the master bedroom, a twin/twin bunk bed in the second VERY small bedroom, and a full pull out couch in the living area. It comes with an equipped kitchen, a large flat screen TV, private washer and dryer, one large garage parking, a private patio with bistro seating and BBQ grill on the ground level, and an outdoor shower with warm and cold water. Keyless Entry System: No keys to pick up or return! All access controlled by access codes which expire after each rental. Our guests love this system. Prior to your visit, we will provide codes for your visit. Please note that the house adjacent has completed its renovation, no noise concern anymore. The unit is within walking distance to restaurants, bars, grocery stores, and beach shops. Belmont Park is 5 blocks away. SeaWorld(3 miles), Gaslamp District(8 miles), Old Town San Diego(5 miles), Zoo(10 miles), Balboa Park(8 miles) and La Jolla(5 miles) are only a short drive away. Just bring your beach towels, this is the perfect place for your vacation! If you have a large group and need more space, we also have a three bedroom unit (3bedrooms/2baths, sleeps 10) in the front with full ocean view (Homeaway #397543).www.homeaway.com/vacation-rental/p397543. Together they sleep up to 16 people. We do not rent to vacationing students. Sorry. Note this property does not have ocean view inside the unit. You can choose $500 refundable security deposit in lieu of $69 damage insurance. Please contact owner by select "email owner". You can also get 3% discount with personal check payment by emailing owner. Please note that we do not advertise on craiglist. Our family has been vacationing in Mission Beach for many years. There are many fun activities around. The wonderful location of this property triggered our purchase when it came on maket. We also remodeled the unit with new roof, new floor, new ceilings with insulations and ceiling fans, etc. to have our guests enjoy their stays more. We love it a lot! A toiletry startup kit is provided: soap, 2 rolls of toilet paper. Bath towel is provided, beach towel is not provided. A startup kit is provided: dish detergent, sponge, 1 roll of paper towel. One house away from ocean, but no ocean view from inside of the unit and the patio downstairs. A startup toiletry kit is provided (2 rolls of toilet paper, 1 kitchen paper roll, 1 bottle of dish detergent and sponge, a few soap bars and trash bags). You may need to bring or buy extra toilet papers, trash bags, etc. Please bring your own beach towels, shampoos and conditioners, and laundry detergent. No AC, but ceiling fans are provided. Garage is shared with the front unit. Wonderful location, really nice brand new kitchen and cute! Relaxed stay. Well equipped with wonderful remodeled kitchen. Unit is neat and clean. Perfect for us. Truly enjoyed the stay. So close to beach and everything else. Walking along the broad walk and watching the sunset are really relaxing experience. No need to drive in and out and find parking spot. Many activities and things are all within walking distance. Unit is not big, but clean dan functioning well. New grill, door, and patio set. Enjoyed our stay. location was great but condition of property was not! This property was not in good condition... a smoke detector was going off when we arrived and it took us 4 phone calls and 2 hours to get it turned off. Also, the patio areas where not as described, very run down with a rusted out table and chairs, along with broken beach chairs, toys etc. There was no place to sit outside and enjoy the ocean breeze and the screen door to the unit was also rusted out with a large hole in it, making it unsafe to sleep with the door open. Pictures of the unit as advertised where over 12 years old. For the price, I expected a lot more than what this unit had to offer. I have rented various units at Mission Beach and have never been misled by a property description until this trip. Thanks for the feedback. We apologize for the situation. Had long discussion with the new property management. Replaced with brand new patio set, grill and screen door, etc. Handyman has spent more than one day in the unit fixing, painting and cleaning up, some furnitures are in the process of being replaced this week. Starting now, we will do routine maintenances to ensure it is in the proper condition. Would really like to obtain timely feedback so we can correct any issues right away. THE PROPERTY WAS IN VERY BAD SHAPE AND WE WERE VERY DISAPPOINTED AS THE PHOTOS THAT WERE POSTED DID NOT LOOK LIKE THE PROPERTY WE RENTED. WE WILL NEVER AGAIN STAY A PROPERTY FROM VRBO AS THEY SHOULD BE BETTER INFORMED OF THE PROPERTIES THEY ARE POSTING FOR FAMILIES SUCH AS OURSELVES TO RENT. THE PHOTOS APPEAR TO BE VERY OLD AND THE PROPERTY NEEDS A COMPLETE REMODEL. FROM THE ADDRESS WE STAYED IN THE OCEAN IS NOT IN VIEW LIKE THE PHOTO THAT IS POSTED. OUR MISTAKE WAS NOT DEMANDING A REFUND WHEN WE ARRIVED. WORD OF ADVICE MAKE SURE YOU DO YOUR HOMEWORK IF YOU DECIDE TO RENT FROM VRBO SO YOU DO NOT STAY IN A VERY RUNDOWN PROPERTY. Thanks for taking your time to write your feedback so we can address timely. As it is advertised (many guests have stated), this is a clean and functioning unit with great location, it is not new and does not have ocean view. In addition, we do address any issues guests bought up timely. In your case, I am very sorry you were dissatisfied, and really hoped we have heard from you during your stay so we can address any concerns you had. I am still trying to collect the list of issues you were not happy with. Hope I will get it from you soon. In the meantime, my property manager and handyman went back to the unit after your review and tried to tight things up. Excellent place for a beach weekend! We spent 4 nights at the cute little condo and it was just right for our family of 4 to enjoy some beach time. The property managers were very responsive and helpful, and the condo had everything we needed for the weekend. We will definitely stay here again. Perfect for enjoying all the beach has to offer. Close to many restaurants and shops. Had a real nice stay. In the heart of Mission Beach, which is a great family vacation place. Close to many attractions, Seaworld,(3 miles), Zoo(10 miles), Old town, La Jolla, etc. Steps to ocean and boardwalk. 5 blocks from Belmont park. Walk to shops, restaurants, surfing lessons, etc. $1000-$2200/wk. Low season per month $2400 + $200 utility You can choose $500 refundable security deposit in lieu of $69 damage insurance. Please contact owner by select "email owner". You can also get 3% discount with personal check payment by emailing owner. This is a second floor unit behind a main house. It has a private patio on ground level( no ocean view).